Bali is one of our favorite island destinations in the Pacific Rim. We recommend to travel to Bali, not for the beaches, but, rather, for its beautiful lush interior, most unique Hindu-animistic culture, and for its luxurious world-class, high-touch resorts. During our last visit to Bali, Bev, Zen and I very much enjoyed walking through the lush green terraced rice fields and villages near the artists’ enclave of Ubud. Religious festivals are held throughout the year and add a special dimension to any stay. The verdant Bali countryside is quite idyllic and surreal. To read more about Bali, visit our blog. 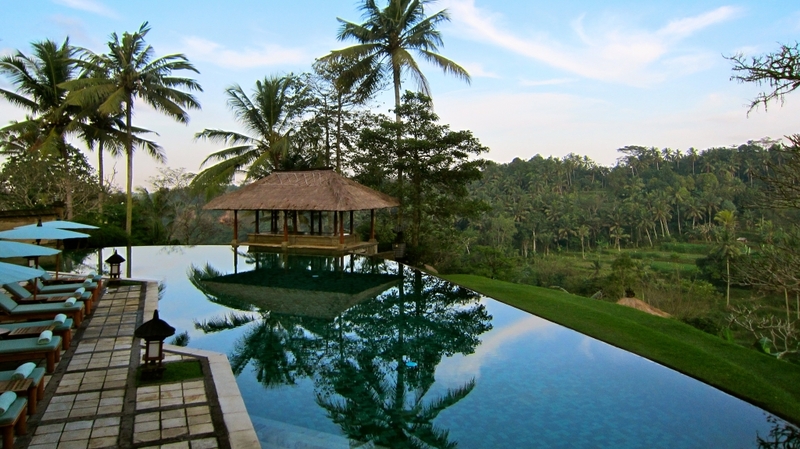 Upon arrival in Bali, you will be privately transferred to the Amandari in Ubud. Enjoy two days of Bali touring including a walk through the Ayung Valley. Beginning at 7:30 a.m., this walk takes you through padded rice fields, sacred springs, stone statues, and shrines, before ending with a picnic at Amandari’s bale (a traditional Balinese rectangular open-sided pavilion with a steeply pitched thatch roof). Also, enjoy visits to many Balinese temples including Pura Gunung Raung Taro, Para Samuan Tiga, Gunung Kiwa, Telaga Waja, Pura Gria Sakti, and Pura Ganung Lebah. A more in-depth overview of these temples can be found here. Enjoy Amandari and all of the luxury amenities at your service! You will be privately transferred to the COMO Shambhala Estate, a 15-minute drive. Explore the mastery of the John Hardy Ubud Workshop & Showroom where fine jewelry is handcrafted through an intricate eight-step process deriving from the traditions of Bali court jewelers. Immersing himself in the techniques of ancient Bali jewelry making, Hardy integrated modern concepts for a delicate fusion of tradition and innovation. The John Hardy Ubud Workshop & Showroom plays host to the most experienced artisans where each piece of jewelry is intimately envisaged, designed, and created for an inimitable work of art. You will also be able to enjoy a traditional Balinese lunch with the artisans and designers for a unique experience and revel in the exquisite collections of John Hardy. Ubud is a special art colony home to many different shops including The Jean- Francois Fichot gallery featuring rare gemstones, fossilized tusks, antique ivory, and fine gold that have been expertly crafted into lavish ornaments and jewelry. Continue to the Rio Helmi Gallery & Cafe to glimpse the iconic photography of Rio Helm who has worked to document Bali through masterful imagery since 1978. You will be privately transferred to the Amanusa, a 1.5-hour drive. Enjoy the many amenities of the Amanusa and the beauty of Bali. Notwithstanding the new luxury resorts opening up throughout Bali, Amandari is still our iconic favorite. Overlooking the Ayung River Gorge (nice for river-rafting!) near the artist’s village of Ubud, the resort consists of 30 pavilion suites, many overlooking the adjacent lush, rice fields. Similar to other Aman locations, the Amandari has an amazing spa, wonderful food featuring local delicacies, and a well-stocked library. Of special note is the spectacular 100 ft. infinity pool, set against the idyllic, green environment. This luxury health retreat/resort is located in what we feel is among the most strikingly beautiful areas of the Ayung River Gorge. The Balinese-style accommodations are made up of 5 Residences, each with 4-5 suites and shared pool. In addition, the property includes more contemporary Estate Suites (5) and Villas (5) with private pools. All suites boast beautiful natural views and various locally-made Balinese fabrics. In addition to Como’s organic restaurant serving Balinese, Italian, and South Asian food, we very much enjoyed its Kudus House, set in a 150-year-old wooden Balinese structure and serving unique regional dishes. The estate’s comprehensive wellness activities include a hydrotherapy spa, nutritionist, a psychotherapist, as well as indoor and outdoor gym. Set on an idyllic garden hillside overlooking the Indian Ocean and at the Bali National Golf Club, we feel the 35-suite Amanusa offers a nice beach option in contrast to your earlier stays at COMO Shambhala and Amandari. All suites come with four-post beds, walled courtyards (with outdoor showers!) and dining tables. Outdoor amenities include a striking 100 ft. freshwater pool, an 18 hole golf course, 24-hour floodlight tennis courts, and the Nusa Dua powdered white beach, just steps away. Although we also like the Amankila in eastern Bali, we think the beach here is much nicer. Despite being in the noisy, touristy Nusa Dua area, the setting at the Amanusa is very exclusive, quiet, and private. Unlike the Amandari, the Amanusa does offer TVs in the room.